Making gingerbread cookies is a true holiday tradition... and so is eating them. Whether cut into little men, reindeer, or a variety of other cookie shapes, these beloved and spiced cookies are a perennial favorite. Rumor has it, they're even irresistible to Santa and his elves. 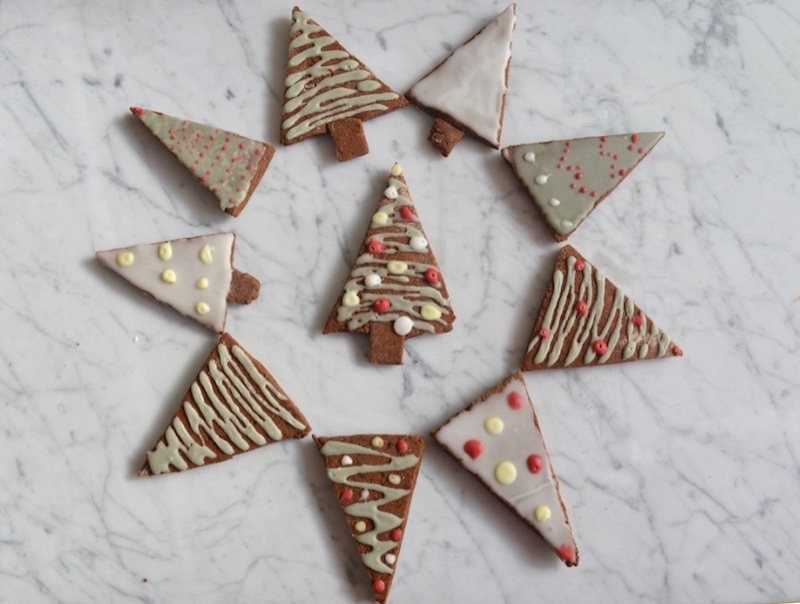 For a cookie version that even little kiddos can help with, we cut our dough into triangles to make trees and then frosted and decorated them with ornaments or designs. 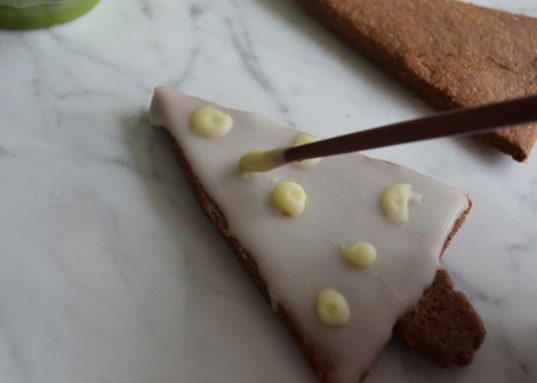 After veganizing and adapting this delicious recipe from Cookie and Kate, we made a quick vegan royal icing that is also simple enough for tots to help whip up. We used India Tree natural food coloring to dye the icing. You can experiment with trying homemade natural versions if you have the time and inclination. We love this version because the molasses, coconut sugar, and coconut oil add a warming richness to the cookie and the combination of whole wheat and whole wheat pastry flours gives it a slightly crisp yet still chewy texture. Make a big plate of these and serve with Mexican hot chocolate for a delicious, cozy bedtime snack. Melt the coconut butter. I like to do this by putting water in a small saucepan and heating it to almost boiling. Then I scoop out the coconut butter into a metal measuring cup that can sit in the hot water and place that in the saucepan. With the water simmering, the coconut butter melts into oil. 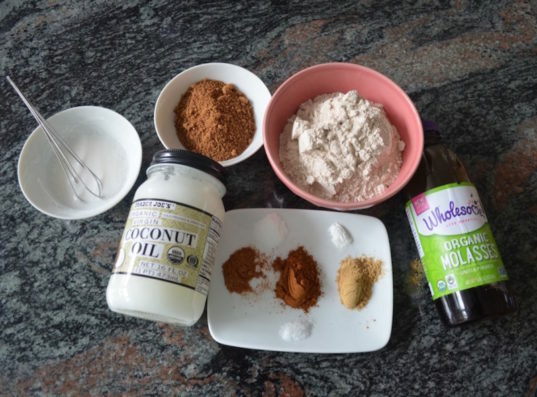 If you live somewhere warm or have a warm kitchen and your coconut butter is already in a liquid state, heat it slightly to help all of the dough ingredients come together. Meanwhile, mix the dry ingredients together in a large bowl. 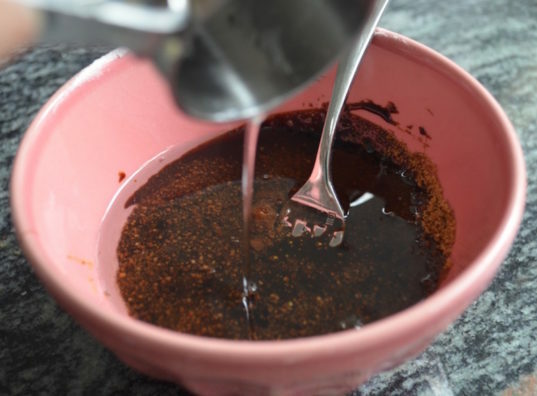 In a separate bowl, add the molasses and coconut sugar and mix. Add the warm, melted coconut oil over the top of the molasses and sugar mixture and whisk until well combined. Next, add the wet mixture to the dry ingredients and stir until it forms a firm yet slightly flexible dough. If needed, add a tablespoon or two of non-dairy milk (one at a time) to the mixture to help the dough come together into a ball without being too crumbly. Once you can shape the dough into a ball, roll it up and then flatten it into a disk. 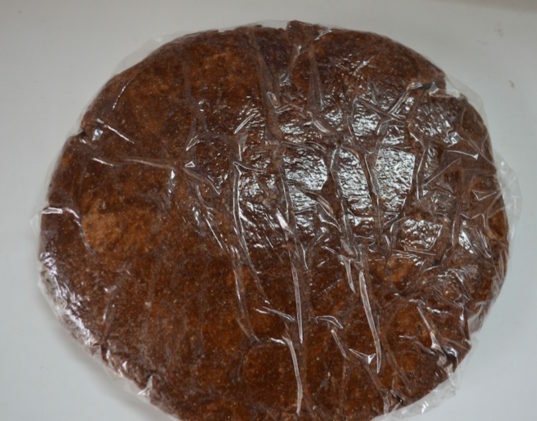 Wrap the disk up in plastic wrap and refrigerate for at least an hour and up to overnight. The dough will get very hard after a few hours in the fridge, but you can let it warm up on the counter for a few minutes before rolling it if necessary. In a medium bowl, add the confectioner’s sugar and light corn syrup, and then add the non-dairy milk, a little bit at a time. Stir well until the icing forms. You want a consistency that is not so runny that it will drip off the cookies and yet not so firm it won’t be smooth or spreadable. One way to test the icing is to dip a fork in it and then lift the fork. If the icing forms ribbons that sit on the surface of the icing and then dissolve back into the icing after a few moments, your icing is ready. If not, you can always adjust by adding a little more non-dairy milk or a little more confectioner’s sugar. Add in food coloring to achieve your preferred decorating colors. 5. Cut out the trees and bake. Preheat the oven to 350 degrees and line a baking sheet with parchment paper or a Silpat. Lightly flour a clean surface and roll out the dough to about 1/4 inch thickness. 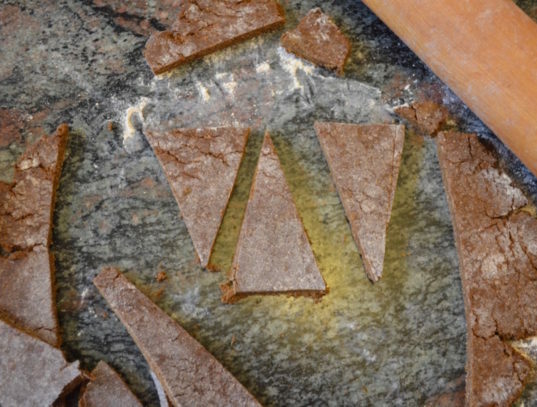 To get the triangle cookie shape, you can cut the dough almost like a pizza by slicing from the center of a circle and then cutting off the “ends.” You can also just cut triangles that are about 3 inches in height using a knife. 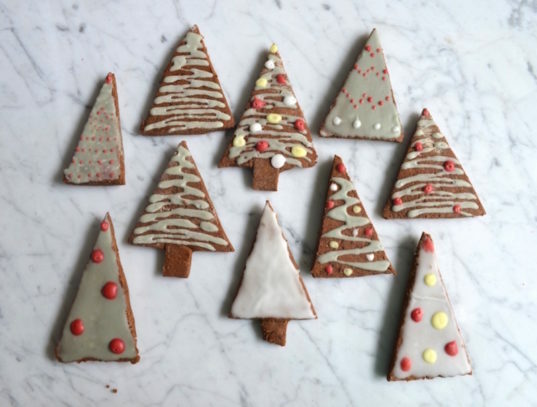 If you want your trees to have trunks, make little rectangles from scrap pieces of dough and press into the bottom of the triangle shape. Place cookies onto the prepared baking sheet and bake 9-11 minutes depending on the size of your trees and how soft you like your cookies. Keep in mind that they will harden as they cool as well. Let the cookies cool on the sheet for at least 1/2 hour so that they don’t “melt” the icing and cause it to run. Pipe the frosting or spread it in thin layers using a knife. We made some of the trees green and others “snow covered” by using plain white icing. Let the first layer dry completely before using a chopstick or toothpick to add other decorations such as ornaments. Serve at your next holiday occasion! This recipe makes approximately 14 trees that were each about three inches tall. You can also put the cookies in an airtight container and leave at room temp for 2-3 days or freeze them for several weeks. Enjoy and happy holidays! In a medium bowl, add the confectioner's sugar and light corn syrup, and then add the non-dairy milk, a little bit at a time. Stir well until the icing forms. You want a consistency that is not so runny that it will drip off the cookies and yet not so firm it won't be smooth or spreadable. One way to test the icing is to dip a fork in it and then lift the fork. If the icing forms ribbons that sit on the surface of the icing and then dissolve back into the icing after a few moments, your icing is ready. If not, you can always adjust by adding a little more non-dairy milk or a little more confectioner's sugar. 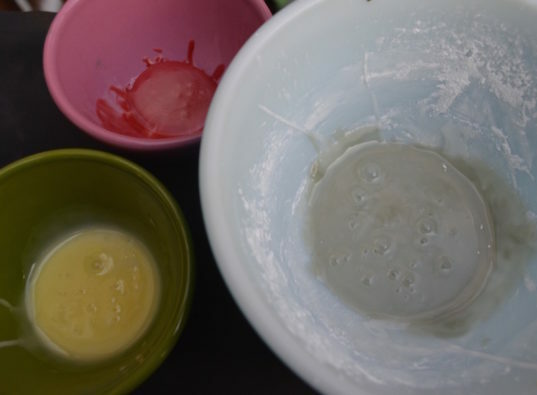 Add in food coloring to achieve your preferred decorating colors. Preheat the oven to 350 degrees and line a baking sheet with parchment paper or a Silpat. Lightly flour a clean surface and roll out the dough to about 1/4 inch thickness. To get the triangle cookie shape, you can cut the dough almost like a pizza by slicing from the center of a circle and then cutting off the "ends." You can also just cut triangles that are about 3 inches in height using a knife. 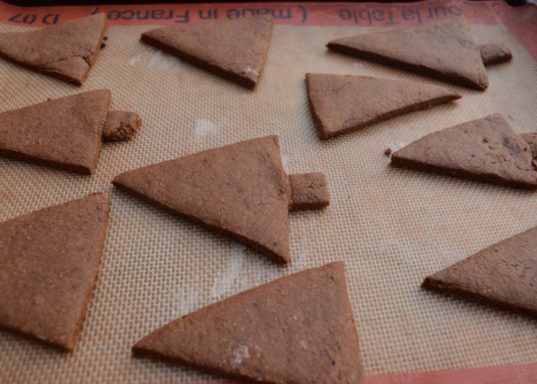 If you want your trees to have trunks, make little rectangles from scrap pieces of dough and press into the bottom of the triangle shape. Place cookies onto the prepared baking sheet and bake 9-11 minutes depending on the size of your trees and how soft you like your cookies. Keep in mind that they will harden as they cool as well. Let the cookies cool on the sheet for at least 1/2 hour so that they don't "melt" the icing and cause it to run. Pipe the frosting or spread it in thin layers using a knife. We made some of the trees green and others "snow covered" by using plain white icing. Let the first layer dry completely before using a chopstick or toothpick to add other decorations such as ornaments.